The Cairngorms weather forecast for today suggested 90mph gusts. 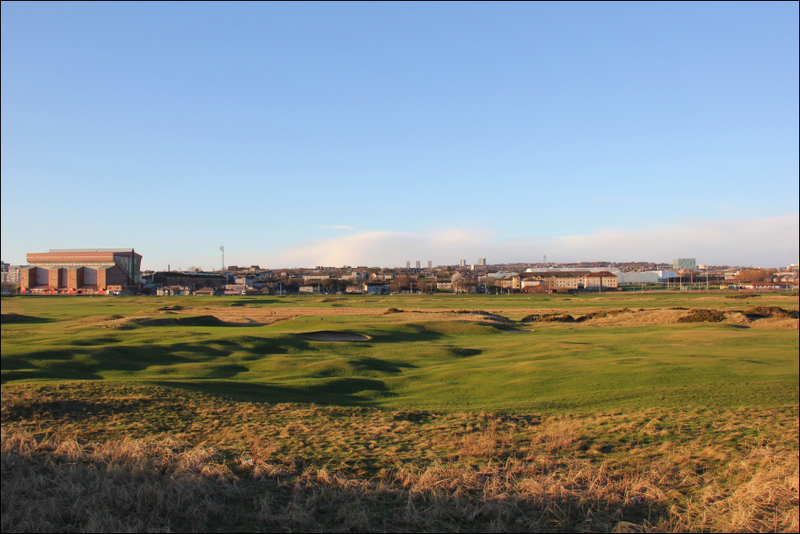 All hill plans were therefore abandoned and instead I opted to visit Aberdeen. 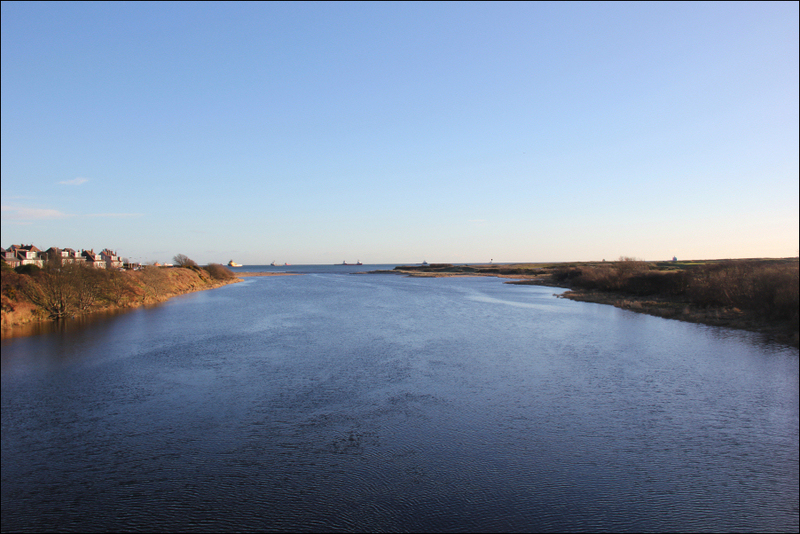 I parked at Footdee with a view to walking alongside Aberdeen Beach as far as the Bridge of Don. 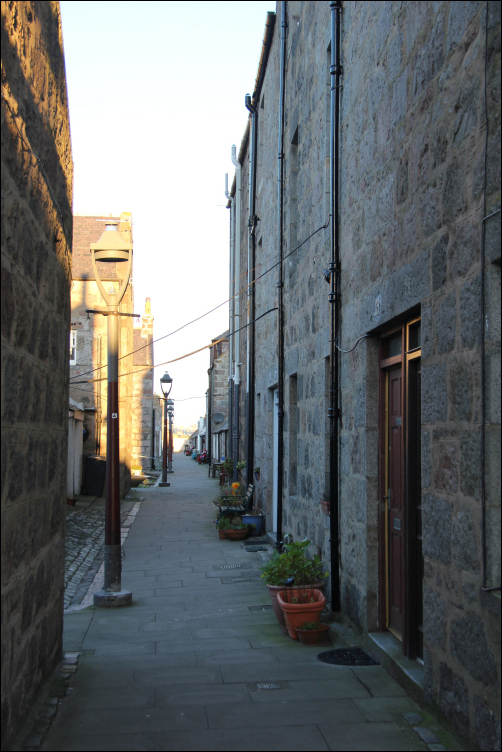 Footdee is an area of Aberdeen known locally as Fittie. It is an old fishing village. 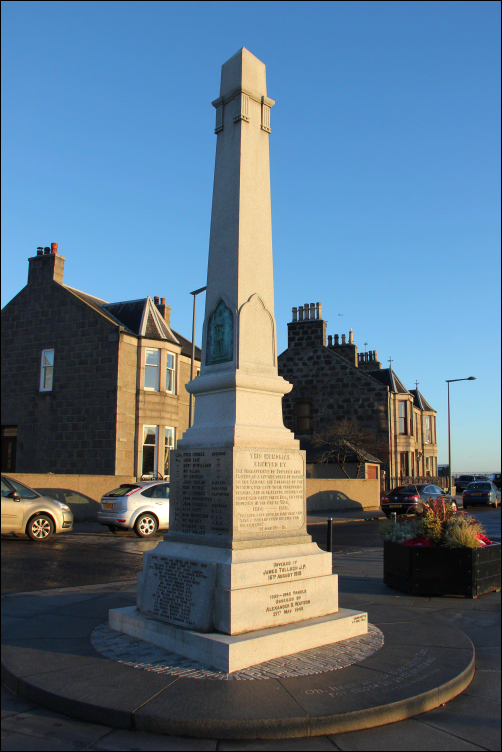 There has been a settlement at Fittie as far back as medieval times; the first recorded reference was in the year 1398. 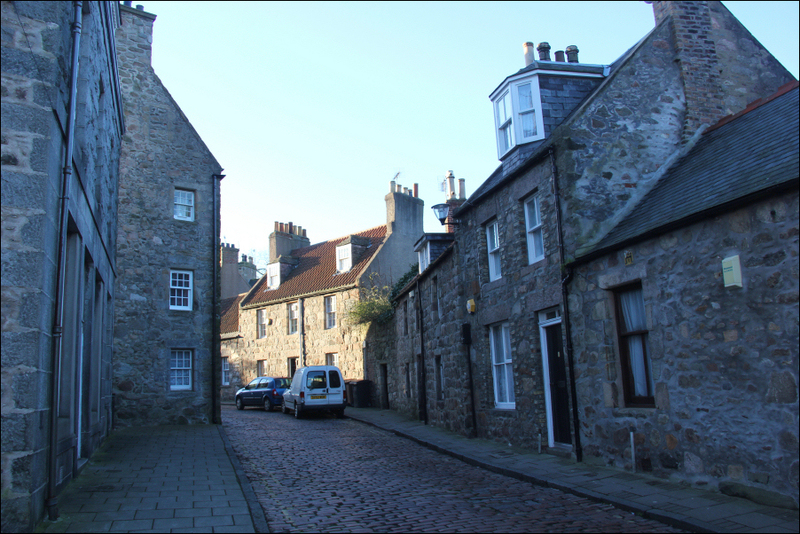 The current houses in Fittie were however only built in the nineteenth century. After having a look at and read of the War Memorial, I made my way along to the Roundhouse. The Roundhouse was built around 1798. 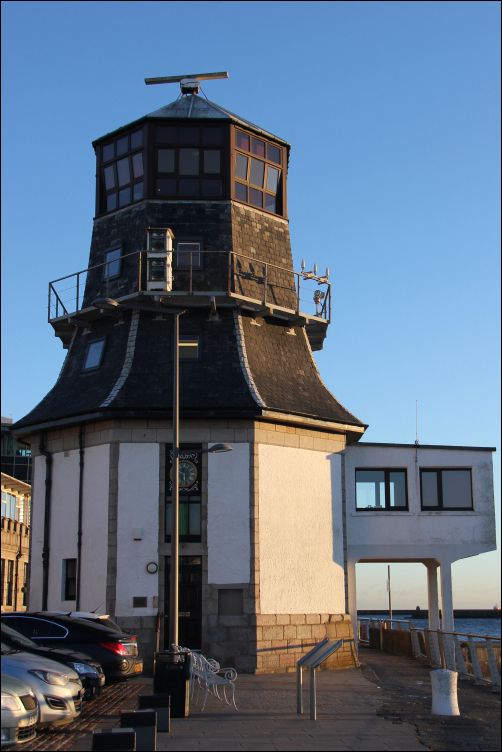 This was the former Harbour Master's station which was in use up to 2006. It is a very distinctive octagonal building. 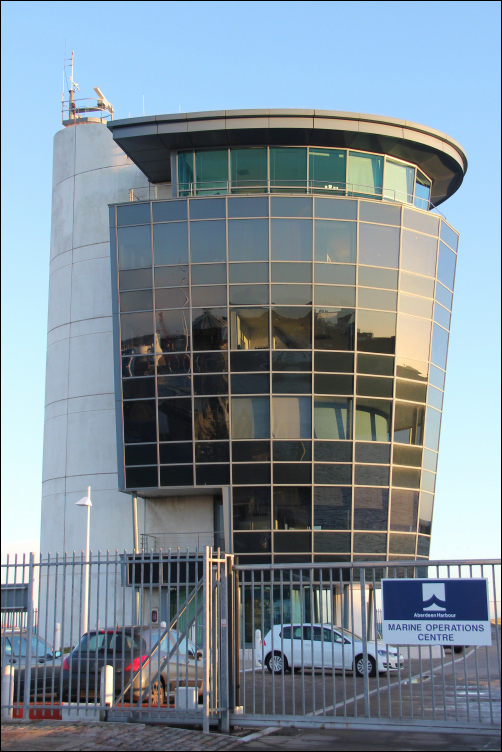 In 2006, the Marine Operations Centre took over from the Roundhouse as the Harbour Master's Station. This building didn't exist when I moved away from living in Aberdeen. 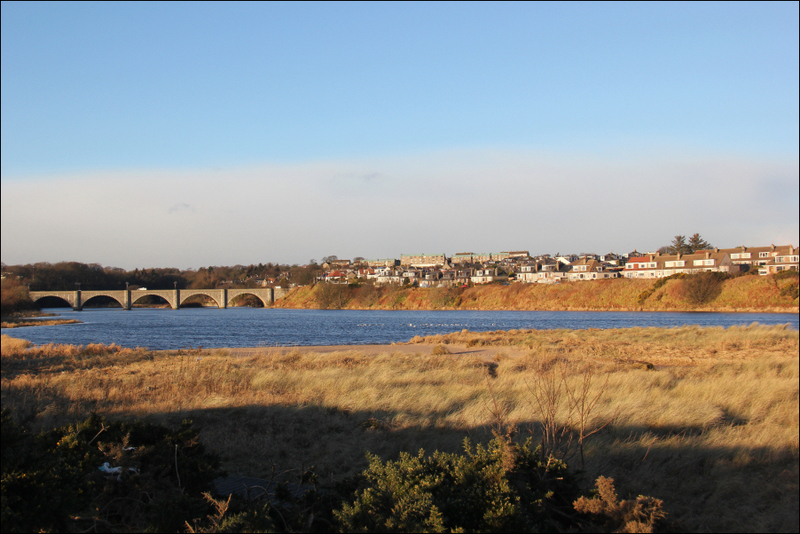 After having a look at some of the houses at Fittie, I made my way towards the start of the pier. 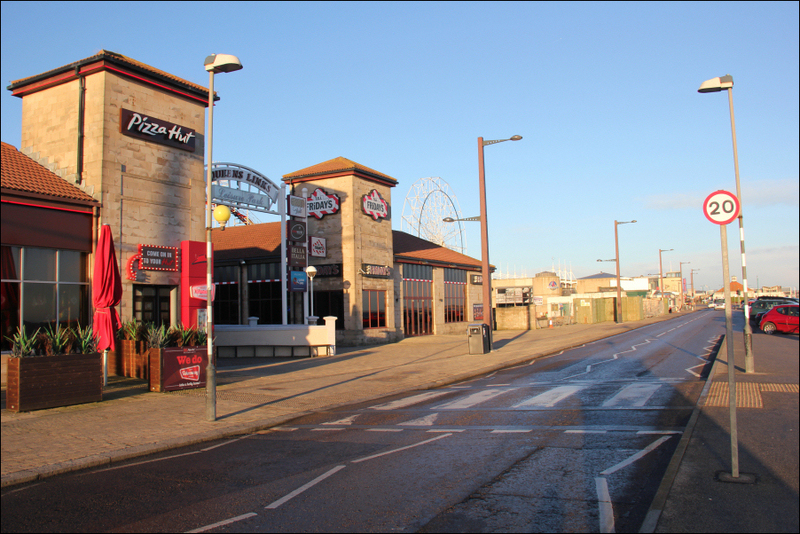 It is no longer possible to walk along the full length of pier as part of it is now closed-off from the public. 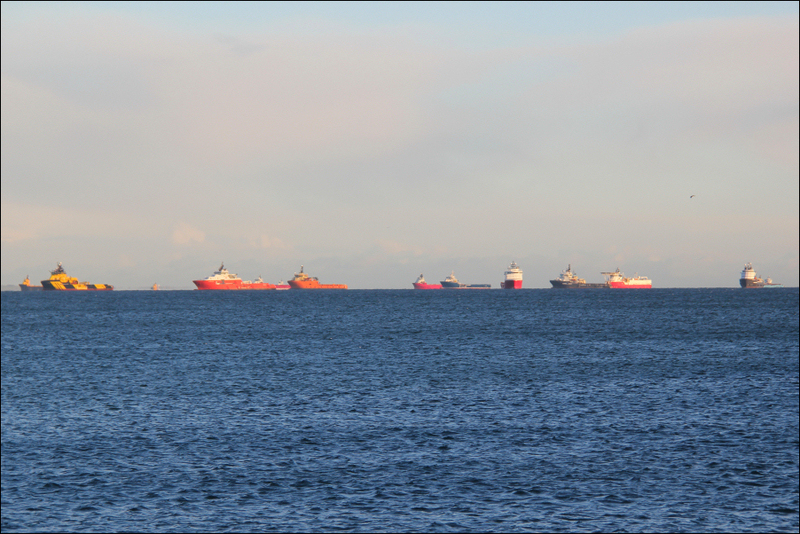 Just offshore were a large selection of boats which were possibly there to sit out the stormy weather. 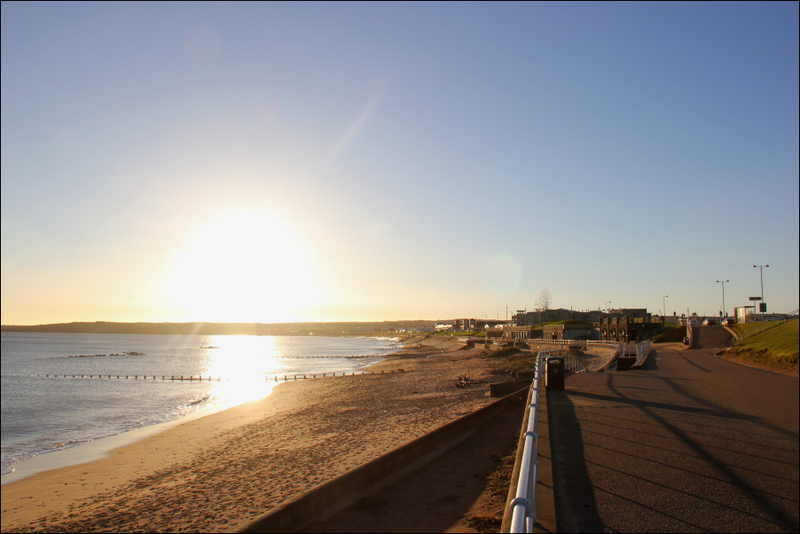 From Fittee, I made my way along Aberdeen Beach. 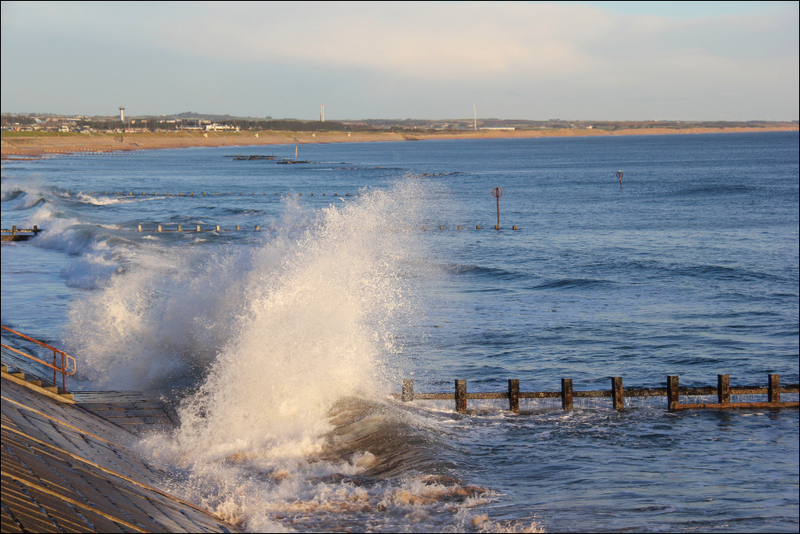 It was not possible today to walk along the sand as it was high tide. There is however a wide non-vehicular track which runs alongside the beach below the pavement and road above. I have walked, ran, cycled and even roller-bladed this stretch of coast more times than I can remember. As I walked along the beach I did much reminiscing. There is now a large furniture store on the esplanade. This building was originally the Amadeus Nightclub which opened in 1997. 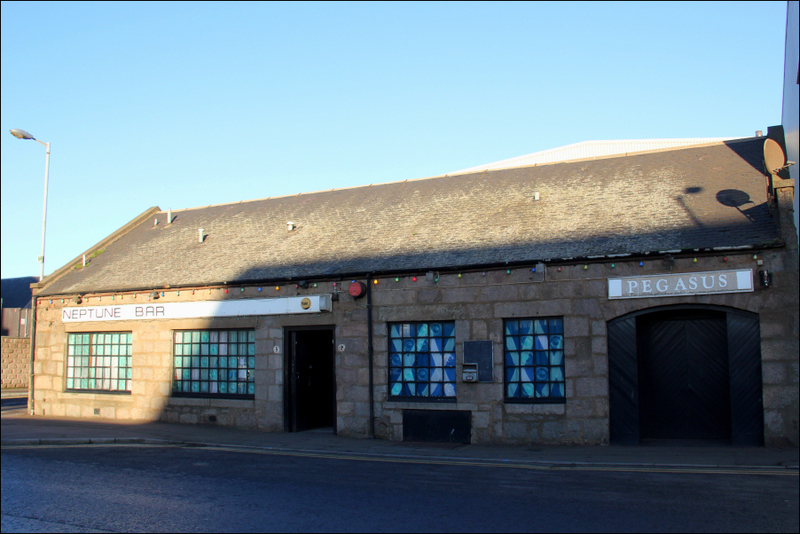 Amadeus was the largest nightclub in Aberdeen and must have also been one of the largest in Scotland. The Inversnecky Cafe has been there for as long as I can remember and a good bit longer. 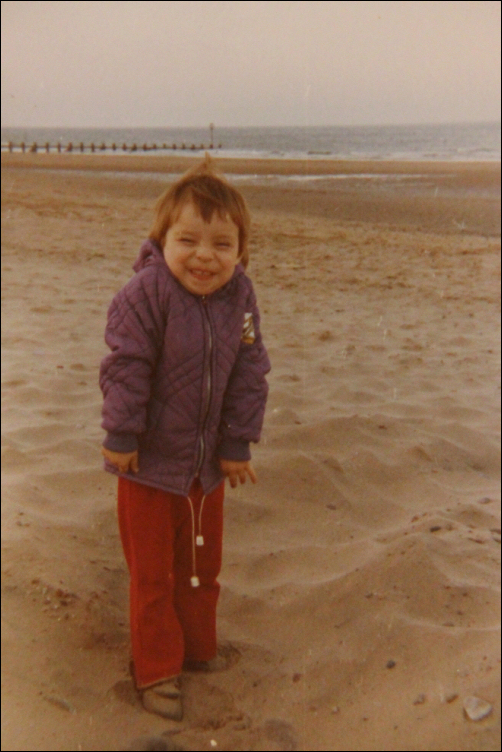 It was nice to think back on fun times visiting Codonas in the 1970s and 1980s with my grand-parents. 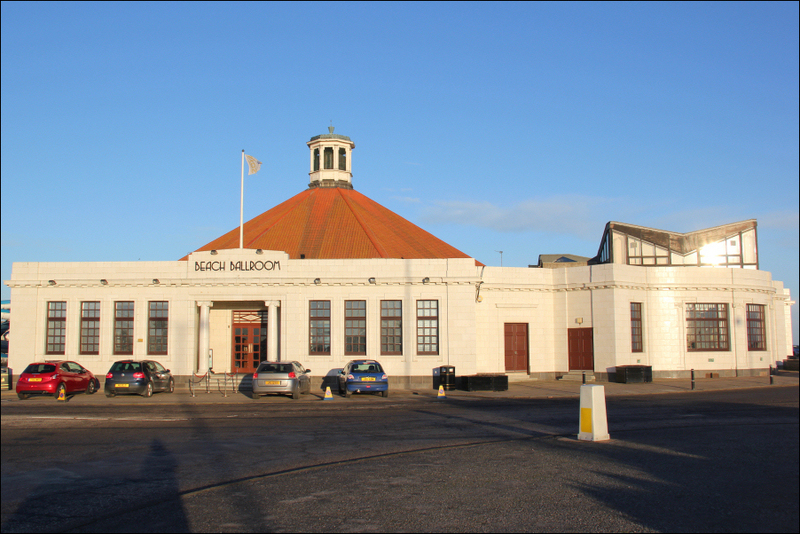 It was also nice to recall visiting the Beach Ballroom countless times in the late 1970s with my dad who used to play in the Beach Ballroom Big Band. I also recalled once playing in a band there myself supporting the Backbeat Beatles. 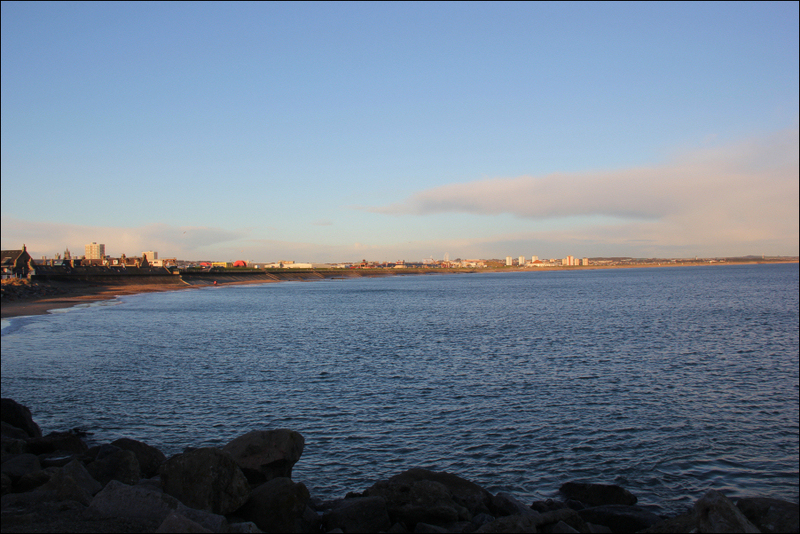 From what I could see of the beach today, it is no longer as nice and clean as it was in the 1970s and 1980s. 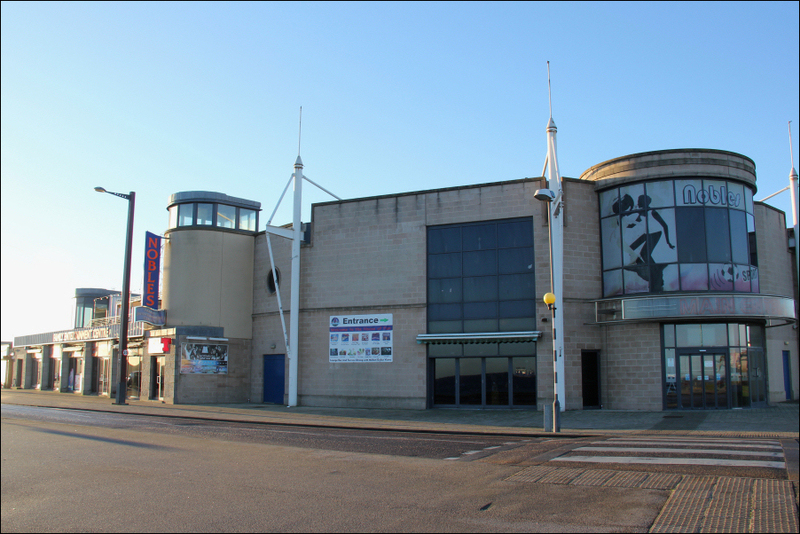 There are now plentiful leisure facilities at Aberdeen Beach including a swimming pool with flumes, skating rink, skatepark and climbing wall. 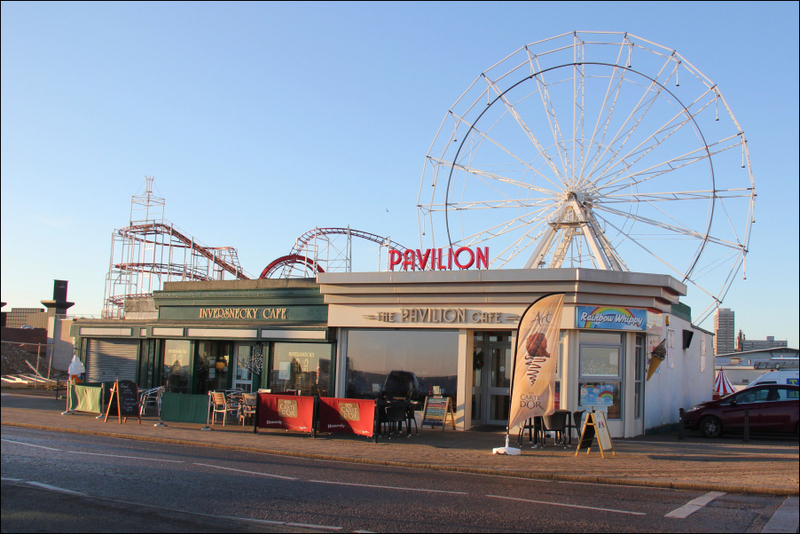 There used to be a wonderful children's play park located behind the Beach Ballroom which was relocated to allow for the building of these facilities. 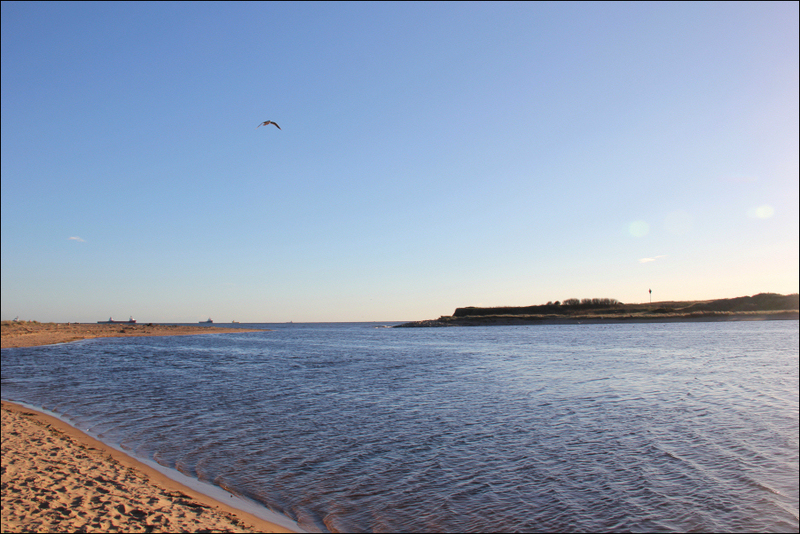 I eventually reached the northern end of the beach before making my way alongside the mouth of the River Don during which I had a brief look inside a bird hide located next to the river. 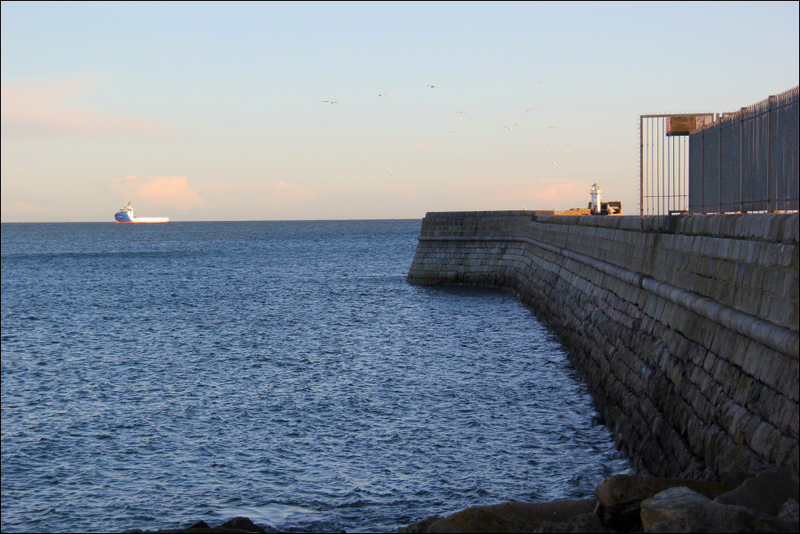 After crossing the Bridge of Don I made my way along to just beyond the small car park at Donmouth. It had been my intention to return to Fittee via the same route. 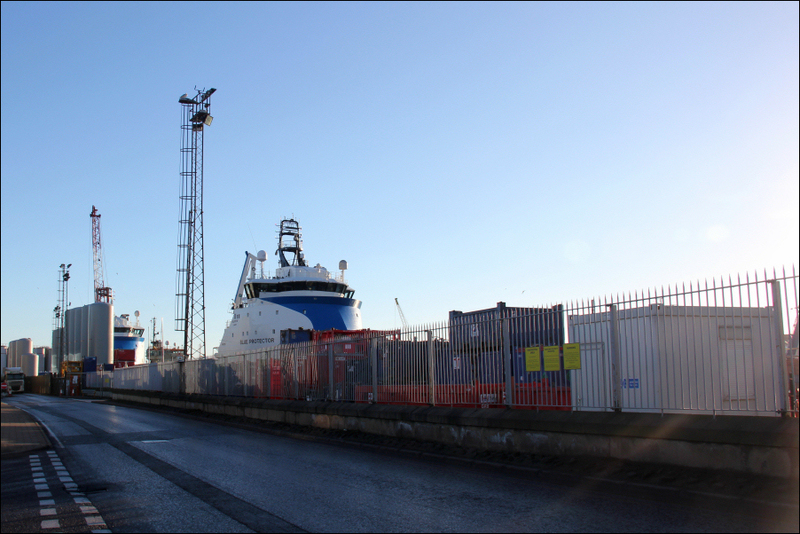 However as it was such a nice day, I decided to undertake a circuit taking in some of Aberdeen's landmarks. 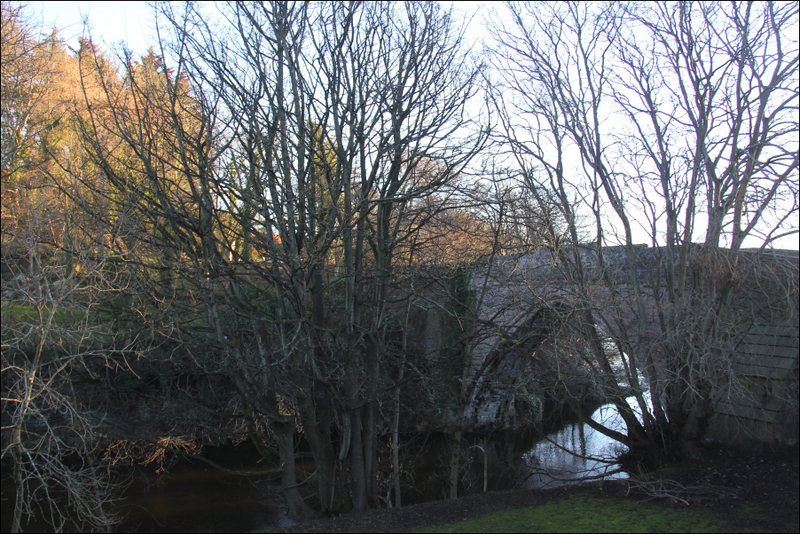 First I made my way to the Brig O'Balgownie. 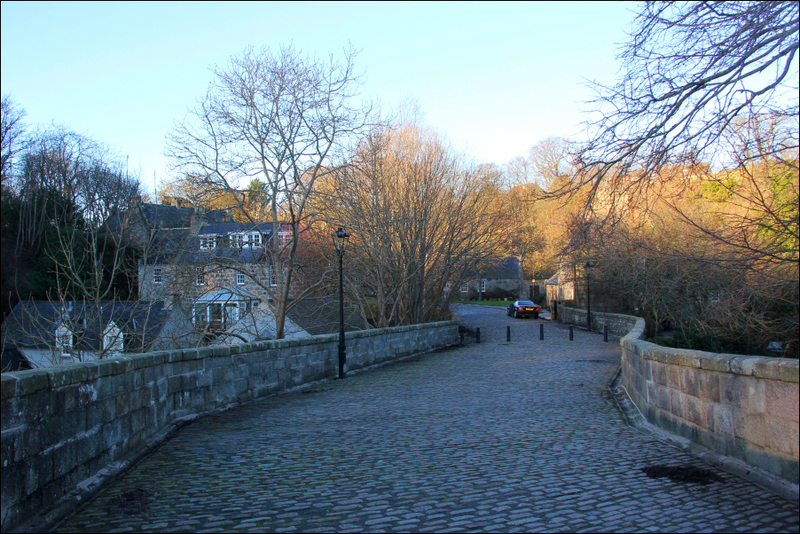 Constuction of the Brig O'Balgownie commenced way back in the thirteenth century. 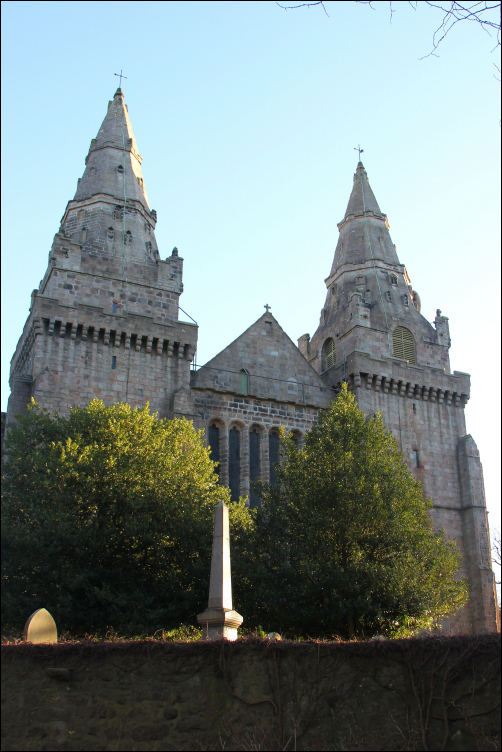 It was completed in 1320 but was extensively renovated in 1605. A very old bridge nonetheless. 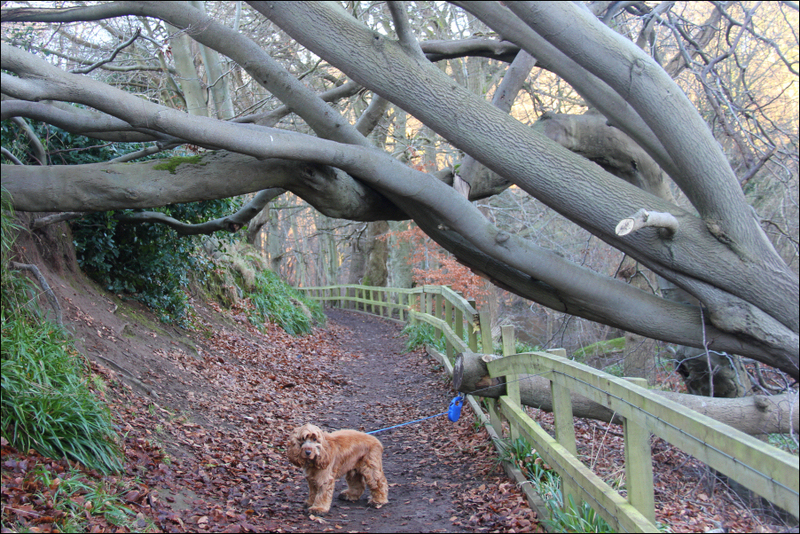 Beyond the Brig O'Balgownie, I walked through Seaton Park woods. The last time I walked this track was at least twenty years ago. Seaton Park is a fairly large park. 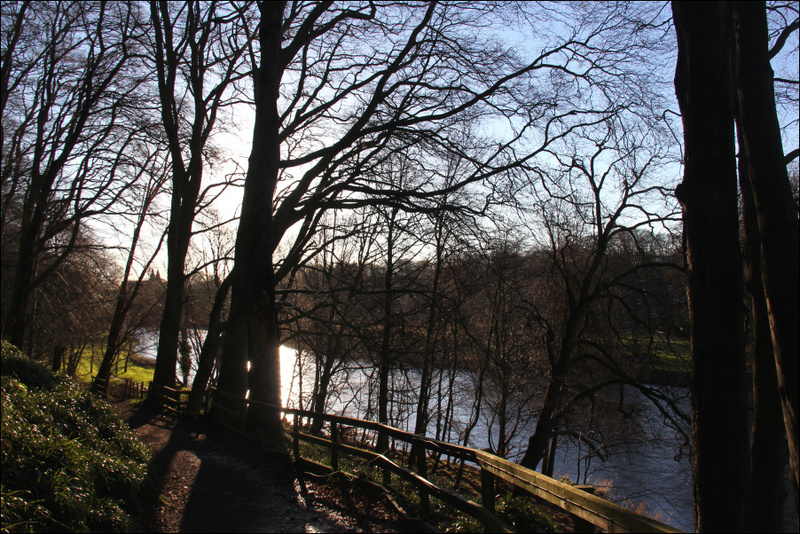 Duthie Park and Hazlehead Park are also both worth a visit on visiting Aberdeen. 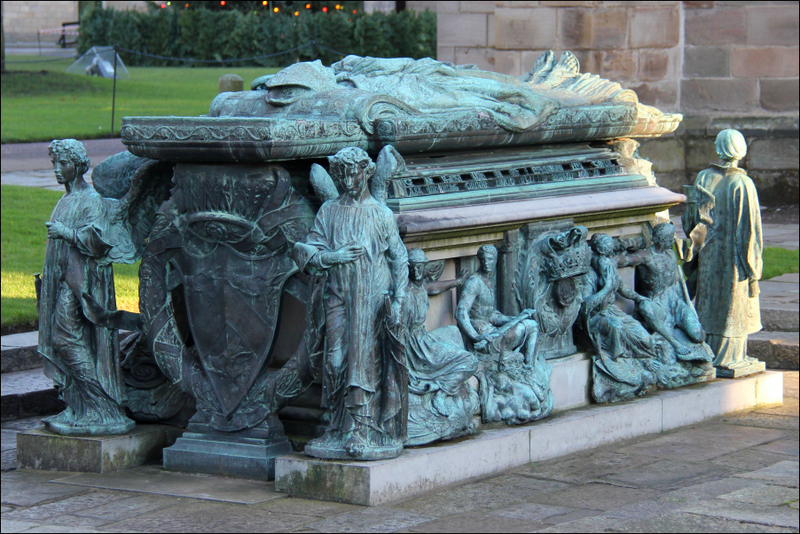 From Seaton Park, I made my way up to visit St. Machar's Cathedral. 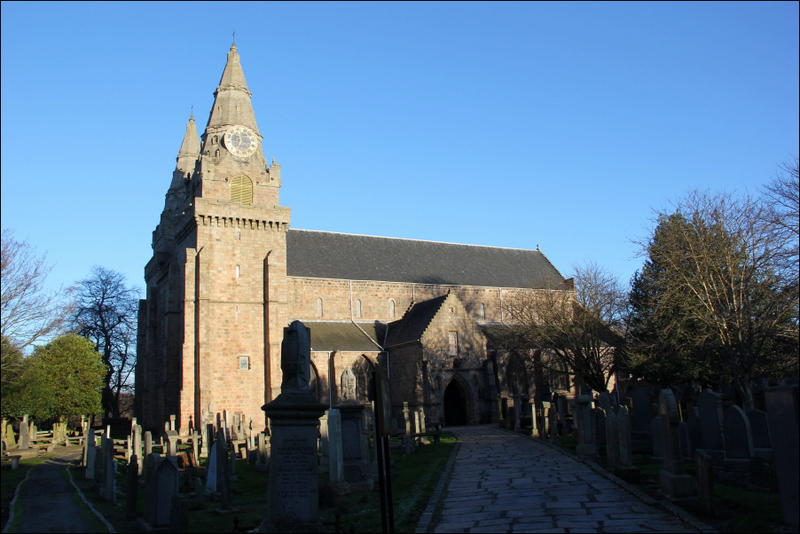 There has been a place of worship on the site of St. Machar's Cathedral since 580AD. It became a cathedral in the 1130s. Work continued on the cathedral for several centuries with it reaching its completed form in 1530. From the cathedral I made my way through Old Aberdeen, down the Chanonry and then along Don Street. After crossing St. Machar Drive, I made my way into very familiar territory. 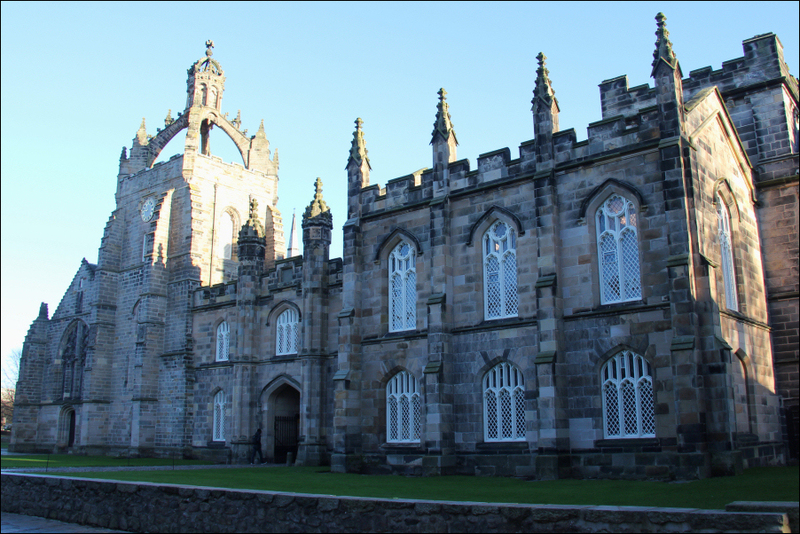 A long time ago, I went to the University of Aberdeen at the King's College campus. 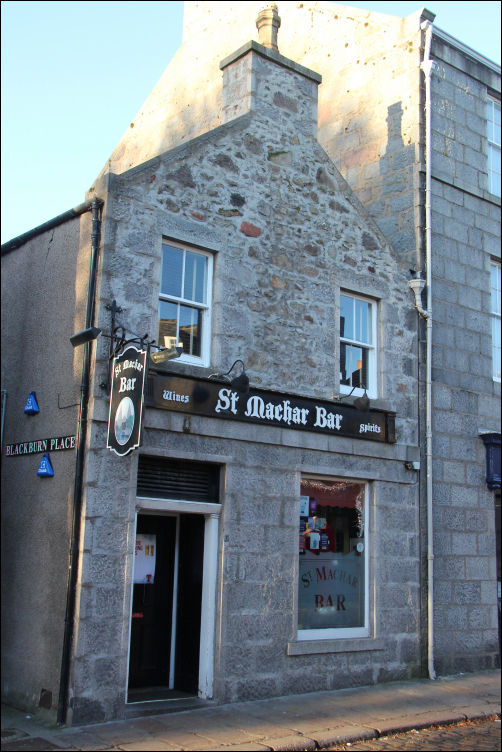 I passed the St. Machar Bar, a real student pub. It was nice to again see King's College. King's College was a formerly independent university founded in 1485. The university buildings here are very nice. 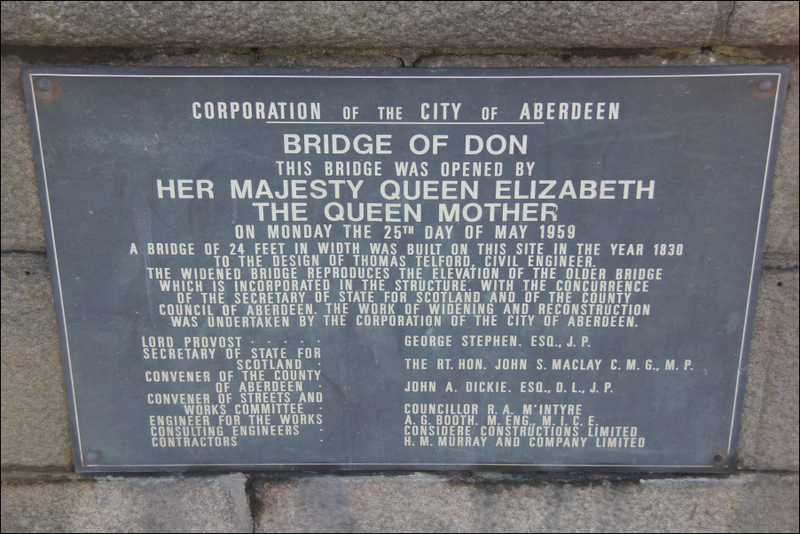 Definitely worth a visit on visiting Aberdeen. From King's College, I made my way along the Spital as far as Mounthooly. From Mounthooly, I then made my way along the Gallowgate to visit Marischal College. Marischal College is now occupied by Aberdeen City Council. 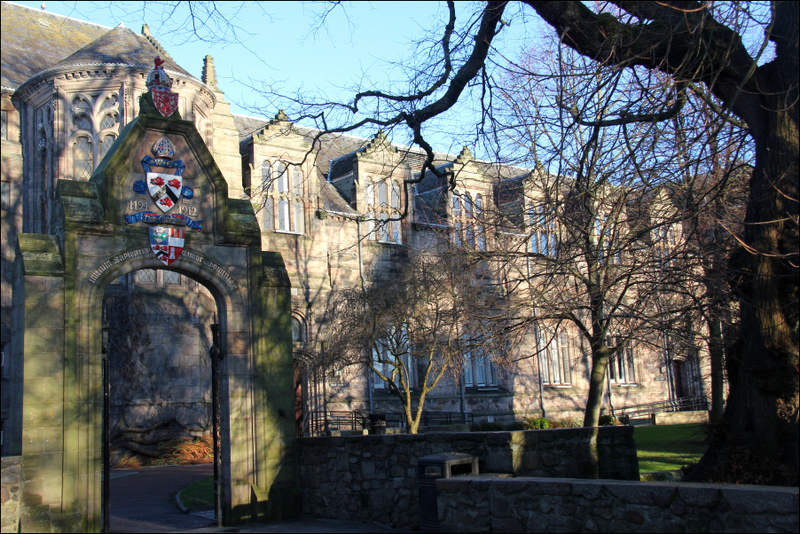 It was formerly occupied by the University of Aberdeen. 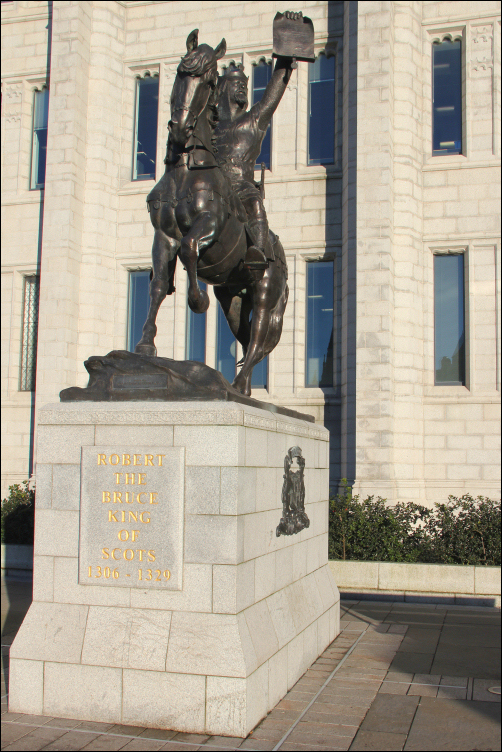 Aberdeen City Council have done a fantastic job cleaning Marischal College; it is a seriously impressive building. 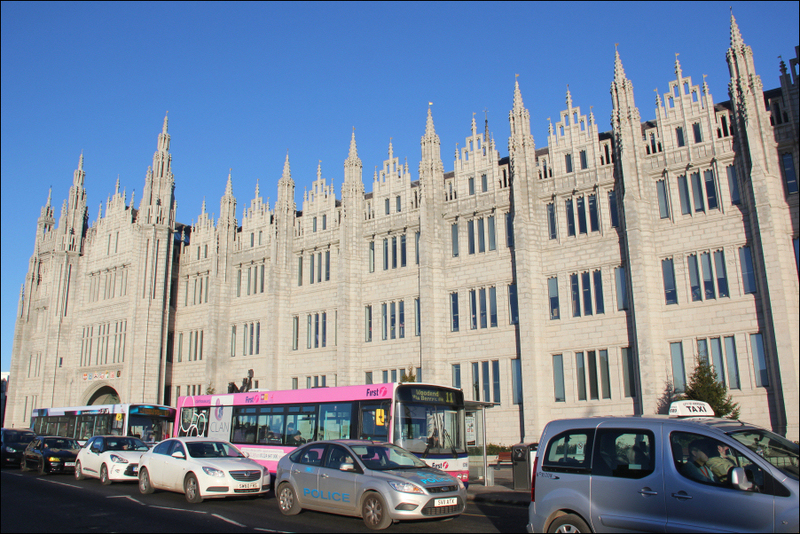 I believe Marischal College is the second largest granite building in the world. 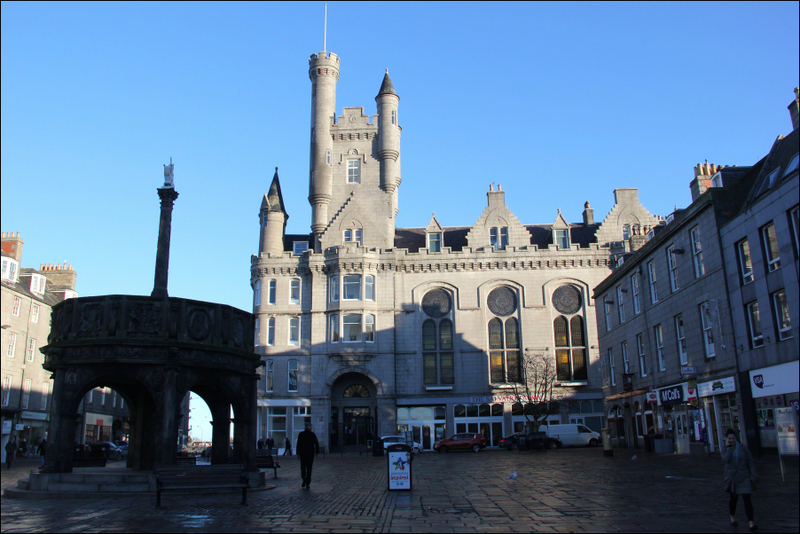 From Marischal College I made my way down to Union Street and then along to the Castlegate. 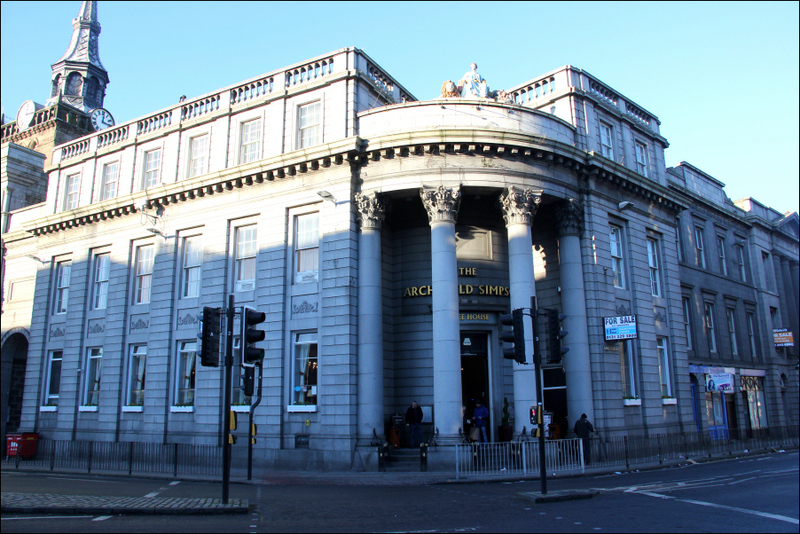 Archibald Simpson is responsible for many of the fine granite buildings in Aberdeen. This building is now a Weatherspoons pub. Mercat Cross was built in 1686. It would be nice if the cross could be cleaned. Behind the cross is the Citadel, home to Aberdeen's Salvation Army. From the Citadel I made my way down to the harbour and then walked along Victoria Dock to get back to Fittee. On the way back I stopped for a drink in the Neptune Bar. 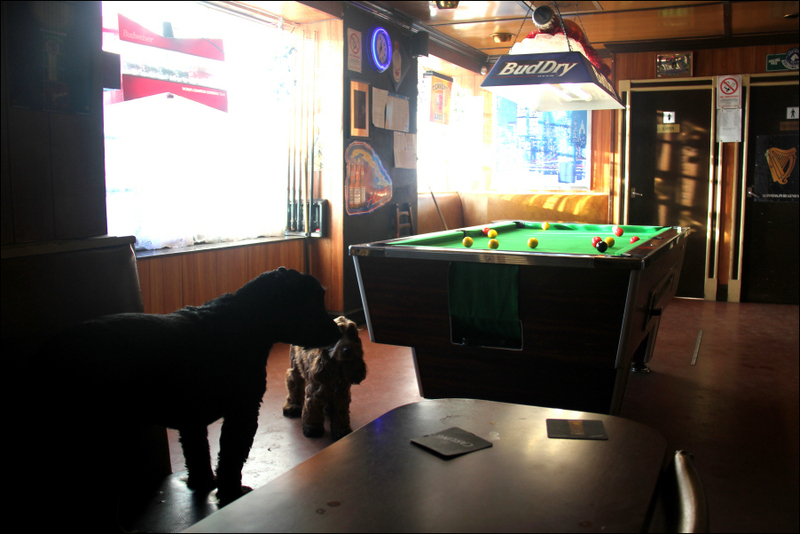 A good wee pub, dogs welcome. I really enjoyed visiting my hame toon and reminiscing of the good old days . So much excellent sight-seeing within a brief three hour walk.